The 10 Best Farmers Markets in Utah! Although Utah is the second driest state in the country, it is also an unlikely hotbed for delicious homegrown fruits and veggies, plus flavorful dairy products and plenty of raw honey. Take advantage of Utah’s bounty at one of these 10 farmers markets. 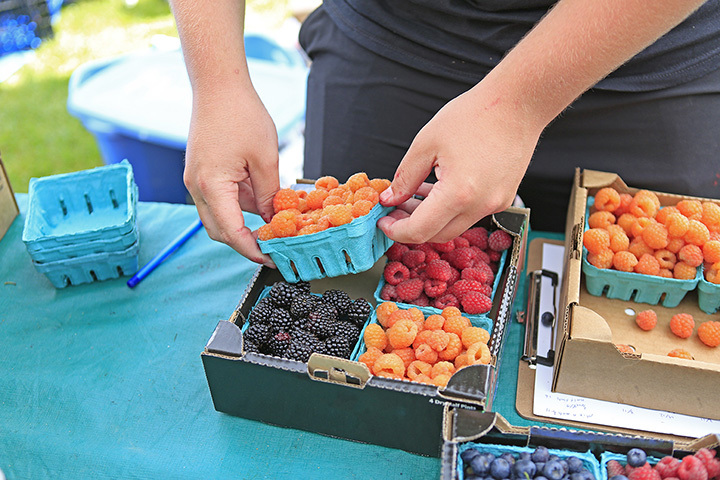 A summer staple in Utah Valley, the Provo Farmers Market offers a wide variety of fresh produce for purchase in addition to plenty of booths providing interesting and tasty options for as many afternoon meals that your body can handle. Another goal of Provo Farmers Market? To provide a hub for artisans, farmers, artists, and all members of the community. Unlike the Provo Farmers Market, the Salt Lake Farmers Market adapts to the seasons and exists year-round. Inevitably, the traditional summer market is the most popular, but the winter market (which is held inside the historic Rio Grande building) satisfies Salt Lake City’s demand for fresh local goods when you’re in need of some increased vitamin C.
Brigham Young University’s very own farmers market, the Stadium Farmers Market is an intimate neighborhood fixture that serves hungry college students as well as cheerful families. Selling famous BYU treats such as “Cougar Tails” (delectably massive maple bars) as well as boxes filled with the sweetest of peaches, this smaller farmer’s market is definitely worth a quick stopover. Moab’s Farmers Market is an oasis in the red rock desert, providing produce, flowers, meat, and even knife sharpening and chair massage services. Started in 2002, this market continues to satisfy the natural cravings of tourists and residents alike. With 196,000 visitors this past year, the Park Silly Sunday Market brings a certain magic to Park City’s Main Street during the warmer months. Cumulative fun for both the outdoorsy and the not-so-outdoorsy, Park Silly is a well-equipped farmers market in a breath-taking setting. With the mission to encourage consumers not only to think about the food they are eating but also about how that food is sourced and grown, the Cache Valley Gardener’s Market creates a connection between Northern Utah’s residents and its respective farmers. Showcasing artisanal goods, the market is also a hotspot for artists and crafters. Also known as the People’s Market, the 9th West Farmers Market is a variation on the more common farmers market in the sense that while it sells local produce and foodstuffs, it also holds various special events throughout the season, including a day where you are encouraged to bring your pets and another day where you can swap books with other Salt Lake City residents. Another popular farmers market in Utah Valley, this market seeks to provide a medium by which local talent can be shown. Whether this comes through farming, gardening, art-making, crafting, or music, the Happy Valley Farmers Market is most definitely a joyful place. Named for Sunnyvale Park in Salt Lake City where it is located, the Sunnyvale Farmers Market is another community hotspot with the mission of unifying those who wouldn’t otherwise come in contact with one another. View more Utah Farmers Markets.